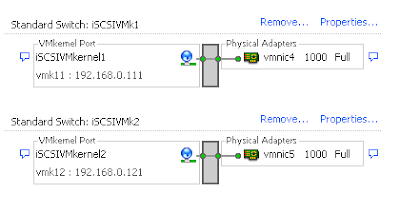 The script below will enable the iSCSI Software Adapter, create two standard switches each with one active network adapter, configure each switch with a configured VMkernel port, bind the iSCSI VMkernels to the iSCSI Software Adapter vmhba, add a send target portal, set the multi-pathing to default to round-robin, and then perform a rescan for storage devices and new volumes. Testing in the lab had a complete VMware Host iSCSI and MPIO configuration applied in less that 20 seconds! The easiest way to run this script is to establish an SSH connection to the ESXi 5 host to be configured using Putty or similar (first start the SSH service on the host using a vSphere Client connection.) Then simply copy the script and right-click to paste into the Putty window - the script will run. 1: In practice you will probably want to run part 1 separately to enable the iSCSI Software Adapter, so can provide the iSCSI Initiator name to input into the SAN management software to allow access to volumes, and also to check the vmhbaXX number. 3: The line in Part 6 works for HP LeftHand/P4000 iSCSI SANs. If you want the multi-pathing to default to round-robin for devices not detected as VMW_SATP_DEFAULT_AA, then this line will need to be modified. 5: See http://pubs.vmware.com/vsphere-50/index.jsp for the full vSphere Command-Line Interface Reference. echo # START COPYING ON THIS LINE! echo # FINISH COPYING ON THIS LINE! esxcli network vswitch standard portgroup policy failover set -p "iSCSIVMkernel1" -a "vmnic4"
esxcli network vswitch standard portgroup policy failover set -p "iSCSIVMkernel2" -a "vmnic5"
There is no command to set an adapter as unused via CLI, only active or standby are possibilities, hence the one active adapter per vSwitch method is used. To only mark 1 iface as active on a portgroup, first specify all interfaces as active, than specify only the one you need. Hello Stefan, thank you very much for the comment and education. So that is how you do it then. Cheers!